The forecasting of “unconstrained demand” has been at the front and centre of revenue management in the last 30 years. Unconstrained demand is a simplistic concept at first sight: the number of rooms you would sell if you had no limit in capacity. But used cleverly, together, with segmentation and pricing buckets it turned yield management into today’s powerful revenue management. If all that sounds like a foreign language to you, don’t despair. At Pace we believe that with the spread of new data science practices these concepts will morph into new ones or altogether disappear. If you are familiar with these terms, then you know their value, but you may also be feeling that new technology might have outgrown some of them. In our previous blog post we discussed how one can do revenue management without ever considering yield management. Implicitly, that already meant that we are not using the concept of unconstrained demand. Why? Simply, because unconstrained demand is actually constrained by price, so there are many unconstrained demands. Which one are you interested in? The one with the current price? The one with another price? In order to forecast demand you need to assume a certain price, or more generally a certain price path. A price path is a set of prices that you could set for a given booking window . The resulting demand will be different for a static high price, compared to a static low price - or if you change prices every day. Your revenue management system should know that, and give you a forecast of demand under certain price path assumptions. A few possible price paths are illustrated in the figure below. The price path in blue represents a revenue manager who never changes prices. 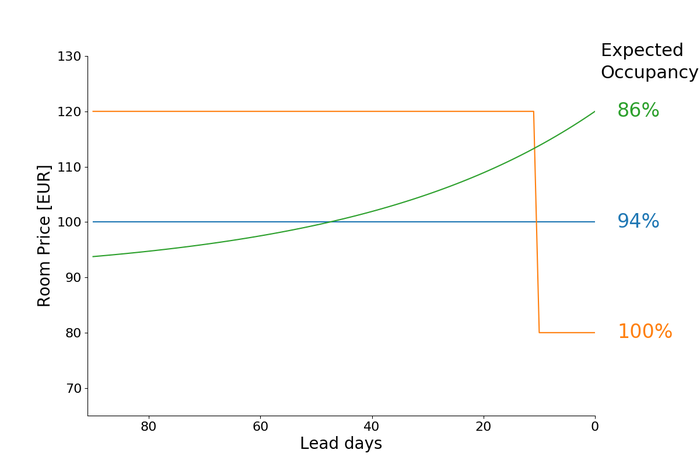 The price path in orange shows what some revenue managers tend to do, set the price high early in the booking window, and discount if they fail to hit their occupancy targets. The price path in green often gives better results : a price path that assumes that people are willing to pay more for their room as their travel date approaches. For each of these price paths we can predict occupancy, and bookings, and they are shown on the right side of the figure. The power of your revenue management system comes from knowing how to price optimally at all times, or rather, building the appropriate price path for a given room and night. The optimal price path is always evolving, as we gather more information about how much people are willing to pay for this room and night. However, at any given time the system (or you as the revenue manager) needs to have a clear idea of how to price in the future if bookings materialize as expected. If your revenue management system is working with unconstrained demand it does not have a concept of price path. Price changes are, instead, the result of a complicated combination of yield forecasting and pricing buckets. More often than not this complicated framework does not generate optimal results. Pace estimates what revenues will be for all likely price paths based on data that are unique to your hotel and picks the price path that maximizes your revenue. Of course, each price path will lead to observing a different demand, but as a revenue manager you are probably comfortable with that as long as your bottom line has improved. If you are still skeptical about potentially not meeting your occupancy targets, or not seeing an unconstrained demand forecast in your revenue management system, don’t worry, we will go into more details about our demand and revenue forecasts in our next blog post.